Sunken Vessel #1 is the remains of a wooden barge. In Merchant Vessels of the United States, Forest No. 15 is listed in the “Unrigged Merchant Vessels” section as a scow that was built in 1924 in Hoquiam, Washington. It weighed 159 tons (gross) and its official ship number was 168887. Its home port was Seattle, Washington. We believe Forest No. 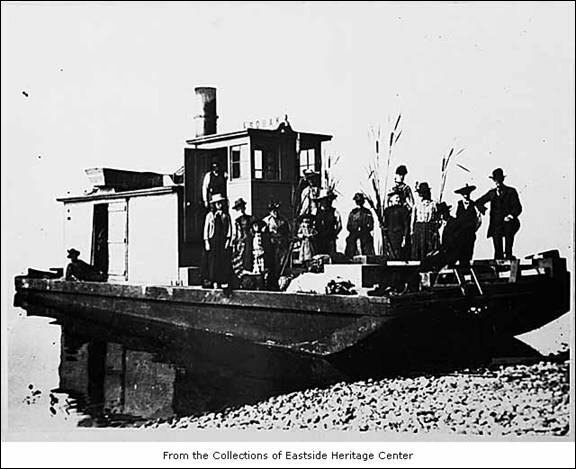 15 may have been one of the barges pulled by the Forest T. Crosby, a steam-powered tug built in Seattle in 1912 by Capt. Harry Crosby. With the tug, Capt. Crosby pioneered the use of multiple barge tows between Puget Sound and British Columbia. Other operators at the time believed such tows were too dangerous to handle in the narrow channels and strong tidal conditions in the region. Capt. Crosby used multiple barge tows successfully, towing as many as six barges on the return voyages from Vancouver to Seattle, and generally taking four loaded barges north. We believe Sunken Vessel #2 is the remains of a wooden steamer. We base our opinion on the shape of the bow, the shallow draft of the hull and the wooden strake (fender) that runs along the outside of the hull from the stern to about 15 feet aft of the bow. At this time, we are only able to identify the type of vessel, and do not have a specific identification. In October 2003, the local news media announced that Sunken Vessel #2 is the remains of the schooner, Fresno. We believe this is extremely unlikely. The Fresno was a three-masted schooner converted to a barge. The Fresno was 197 feet long, 38 feet wide and 23 feet high, much larger than the hull of Sunken Vessel #2. In addition, the bow of the Fresno was typical of a schooner (sloped) and not square like the bow of Sunken Vessel #2. The Fresno also did not have a wooden strake (fender) running around the outside of her hull. We know from the historical record that the Fresno burned at the dock in Meydenbauer Bay, Bellevue, Washington, on April 4, 1923. The fire was allowed to burn itself out, as no equipment was available to extinguish the flames. After the fire, the owners of the Fresno filled her hull with gravel and then hauled the hull out into the lake and sank it in deep water [see North Pacific Sea Products Co. v. Nieder, 137 Wn 85 (1925)]. We did not find any gravel inside the hull of Sunken Vessel #2. In addition, you have to ask, why would the owners of the Fresno haul her approximately four miles (north of the existing 520 bridge), when there is plenty of deep water much closer to Meydenbauer Bay? The side scan survey conducted for DOT was limited to a small area on either side of the existing 520 bridge. As a result, the DOT survey did not include another sunken vessel in Lake Washington off Groat Point (close to Meydenbauer Bay) that we believe is the likely remains of the Fresno. 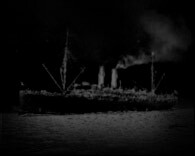 Although this hull is badly damaged and we have not yet found anything to positively identify it as the Fresno, (i) the hull’s dimensions are close to the reported size of the Fresno, (ii) the hull is badly burned, (iii) the hull is filled with gravel and (iv) the hull has a rudder and rigging similar to those marked with a circle in the photograph below. Set forth below is a side scan sonar image of the Fresno hull provided by Inner Space Exploration Team. The hull of the vessel appears to have broken into two pieces when the vessel struck the bottom of the lake. The stern of the vessel is the end where the two parts of the hull are joined together. You can see the shadow of the rudder off the stern (lower right side of image). You can also see the remains of the rigging on the starboard (right) side of the vessel, about midway down the hull (top-center of image). Side scan image of Fresno hull. Sunken Vessel #3 is the remains of a wooden scow. We believe Sunken Vessel #3 is much older than Sunken Vessel #1 - Forest No. 15. We base our opinion on the construction of the scow, which is more primitive, and on the large iron spikes used as nails. We believe this scow was probably built between 1880 and 1900. While we have not found anything to specifically identify Sunken Vessel #3, the vessel is similar to the hull of the Squak, and Sunken Vessel #3 may be the remains of the Squak. The Squak was a flat-bottomed, steam-powered scow built in 1884 at Pontiac by Edward F. Lee for Captain J.C. O’Conner of Houghton (present day Kirkland). The Squak was one of the first vessels used to transport goods and passengers east from Seattle. 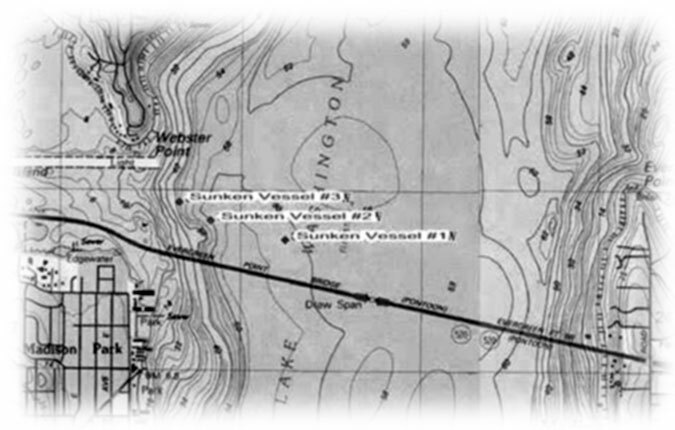 The Squak carried goods and passengers on Lake Washington and also made trips up Squak Slough and Squak Lake (renamed Sammamish River and Lake Sammamish) to Tibbets Landing (present day Issaquah). On December 25, 1890, the Squak foundered in high winds and sank in Lake Washington with no cargo. A photograph of the Squak is set forth below. The hull of Sunken Vessel #3 has the same general appearance as the hull of the Squak shown in the photograph above. In addition, the construction of Sunken Vessel #3 at the bow where the different pieces of wood are joined together is similar to the construction of the Squak shown in the photograph above. Further, the primitive construction of Sunken Vessel #3 suggests that it was most likely built during the same time period as the Squak, between 1880 and 1900. We have not yet located the exact dimensions of the Squak. The dimensions which are commonly available come from secondary sources and may not be accurate. These commonly reported dimensions suggest that the Squak was smaller than Sunken Vessel #3. However, from the photograph above, the approximate dimensions of Sunken Vessel #3 and the Squak appear to be a reasonably close match. Although we did not find any evidence of a cabin on Sunken Vessel #3, it is not unusual for light-weight frame cabins to wash off a vessel during its sinking. It is also unclear whether the interior of Sunken Vessel #3 contains the remains of a steam engine. The rear section of Sunken Vessel #3 is covered by decking and you cannot see inside. We have observed pipes and valves in the interior of the hull of Sunken Vessel #3, which suggests that some kind of machinery is on board. To date, none of the dive teams have attempted to crawl inside the aft section of Sunken Vessel #3 to confirm whether or not it contains the remains of a steam engine. The side scan image of Sunken Vessel #3 also shows a fair amount of debris around the vessel, some of which may have come from the vessel. Our research of the historical record has not uncovered another likely identity for Sunken Vessel #3. Based on the historical record, the Squak appears to be a likely identity. Based on its independent evaluation, SCRET disagrees strongly with CH2M Hill’s conclusion that the three sunken vessels do not possess any historical significance. This is especially true with respect to Sunken Vessel #3, the unnamed wooden scow that may be the remains of the Squak. 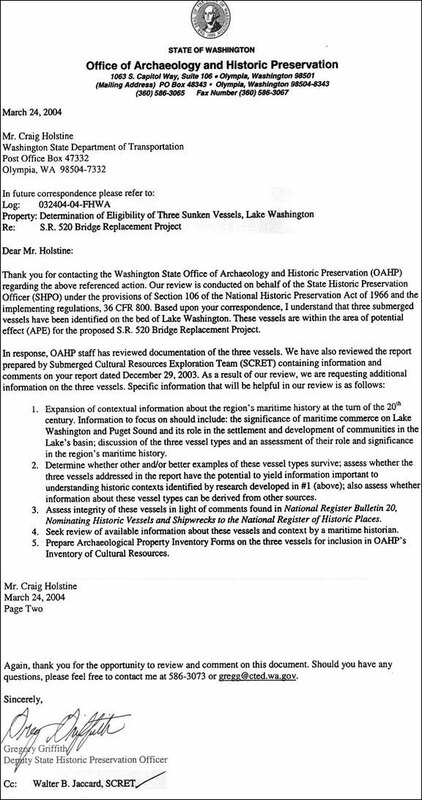 SCRET has stated its position in letters to DOT and the Washington Office of Archeology and Historic Preservation. 1) association with events that have made a significant contribution to the broad patterns of our history; or 2) that are associated with the lives of persons significant in our past; or 3) that embody the distinctive characteristics of a type, period or method of construction, or that represent the work of a master, or that possess high artistic value, or that represent a significant and distinguishable entity whose components may lack individual distinction; or 4) that have yielded, or may be likely to yield, information in prehistory or history. The Squak appears to satisfy all four of the National Register criteria. The Squak is closely associated with the early maritime industry that played a significant role in the development of the communities east of Seattle, including Kirkland and Issaquah. The Squak was used by many early settlers of these eastside communities, including Peter Kirk, who played an important role in the early development of Kirkland. Several of the passengers in the photograph of the Squak set forth above are believed to be members of Peter Kirk’s family. Sunken Vessel #3 may represent the only known example of an 1880’s scow. The hull of Sunken Vessel #3 embodies the distinctive characteristics of this type of vessel and the type or method of construction used during the 1880’s. As a result, the sunken vessel is likely to yield important information about this type of vessel and its method of construction. Further, this type of information may not be available elsewhere. Sunken Vessel #3 dates from the same historical period as the two other sunken vessels in Washington that the Office of Archaeology & Historic Preservation has determined are eligible for listing on the National Register of Historic Places. These other vessels are the AJ Fuller, built in 1881, and the Multnomah, built in 1885. While an old scow may not be quite as glamorous as these other vessels, the scow played an equally important part in our early maritime history and should be afforded the same protection. It is also important to note that, given Sunken Vessel #3’s resting place in Lake Washington, the vessel is not exposed to the destructive marine organisms that destroy sunken vessels in salt water. The remains of Sunken Vessel #3 will continue to be well preserved by the cold, deep waters of the lake for a long period of time. Even if it is ultimately determined that Sunken Vessel #3 is not the Squak, the vessel dates from the same time period as the Squak and the hull is of a similar type and construction. As a result, Sunken Vessel #3 would still appear to satisfy several of the National Register criteria. Sunken Vessel #3 has a general association with the area’s maritime history, and it embodies the distinctive characteristics of an 1880’s scow and the type or method of construction used during the 1880’s. Further, Sunken Vessel #3 would still be likely to yield important information about this type of vessel and its method of construction. Given the historical significance of Sunken Vessel #3, SCRET asked DOT to reconsider the position it expressed in its January 9 press release. SCRET believes the determination made by DOT was premature, and SCRET recommended further evaluation and reassessment, preferably by a reputable marine archeologist. SCRET also asked Robert Mester, Director of Underwater Admiralty Services, Inc., and James Delgado, Executive Director of the Vancouver Maritime Museum, to review and comment on the “Sunken Vessel Summary Report” prepared by CH2M Hill and SCRET’s response to DOT. Both Mr. Mester and Mr. Delgado are recognized authorities on sunken vessels and the manner in which such vessels should be evaluated to determine their historical significance. Both Mr. Mester and Mr. Delgado provided letters expressing their concern with the determination made by DOT and recommending further evaluation and reassessment of the three sunken vessels.